The traveller’s path around Europe is a well-trodden one, with accounts of the opulence of the Grand Tours of Italy and the excitement of the Orient Express, minus the murder. But we are privileged to live in a time where travel is an achievable goal and not just the luxury of the aristocracy. With the bargain prices on offer, allowing you to travel the full length of Europe and back without any hidden costs, this sense is even stronger. For those on a tight budget, there is no easier way to keep control of your spending than to have a single payment for all of your travel costs. So whether you’re soaking up the ancient cultures of Europe or just soaking up some sun, you can feel safe knowing that when push comes to shove, all you need is your interRail ticket to get you home. You’ll have some of the top travel destinations in the world at your fingertips - the balmy French Riviera, the ancient cultures of Greece and Italy, the breathtaking natural beauty of the Scandinavian mountains - and the freedom to travel amongst them at a timetable that suits your mood. So get out your map and start circling your dream destinations! 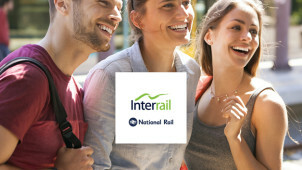 How do I use my My InterRail coupon? Fill in your promo code if applicable. Use your InterRail Pass for a trip on a night train to cut down on accommodation costs. How do I know if I qualify for a My InterRail pass? Any resident of one of the 30 participating European countries can qualify for the pass. For a list of participating countries click here. How does a My InterRail pass work? Depending on your specific pass, you will receive an allocated number of travel days within your travel period (e.g. 15 days travel within 1-month validity) during which time you can hop on as many and any trains you would like. Some passes will just be a continued length of travel time in which you can travel every day. Can I take a bicycle with My InterRail pass? You can usually take two items and a piece of hand luggage free of charge. You can also take skis, snowboards etc, free of charge, and even your bike as hand luggage if it can be folded. Your pass will be sent to you via Royal Mail with next special delivery, excluding weekends and bank holidays. Refunds are available, but your pass must be physically returned to My InterRail before the start date, and there will be a 15% cancellation fee and a £10 administration charge. If you’re struggling to decide where to travel this holiday and the options look too good to pass up, enjoy them all at your leisure with My InterRail. With your My InterRail coupon, you can travel around any of the 30 participating European countries for less, with absolute freedom and just one ticket. Your pass could take you hopping around the sunkissed Greek isles, and dust the snow off Norwegian fjords all in the same trip. My InterRail is brought to you by the National Rail, so the same company that take you home for Christmas can take you away on an unconstrained Christmas holiday. With special deals for travelling families, senior passes and youth passes, for those under the age of 27, you’re sure to find savings on your dream holiday, and with the total freedom to travel around Europe at your whim, every traveller in your group can find their ideal destination. Want to get to know a country through and through? You can experience the thrill of learning a country’s language, history and culture with a One Country Pass. With a My InterRail Discount Code , you can immerse yourself in the full diversity of one of the 27 participating countries without having to pay an extortionate travel bill. You can even catch three countries in one with the Benelux Pass, including The Netherlands, Belgium and Luxembourg.